CHICAGO – Chevrolet today announced pricing for its all-new 2008 Malibu midsize sedan lineup, with MSRPs starting at $19,995 for the base LS and for the first time, a hybrid for $22,790. The Malibu continues to drive home Chevy’s commitment to dependable, fun-to-drive cars packed with value. Malibu is built to be the best midsize car in the market, having been benchmarked against the top names in the class and loaded with standard features that many competitors don’t offer at any price. The design team focused on the attributes that mattered most to midsize car buyers such as families and commuters. All Malibus are equipped with a long list of standard features, including six air bags (dual-stage frontal, seat-mounted side-impact thorax and head-curtain side air bags); four-wheel anti-lock disc brakes with all-speed traction control; OnStar Gen 7 safety and security system with Turn-by-Turn Navigation; air conditioning; and XM Satellite Radio. 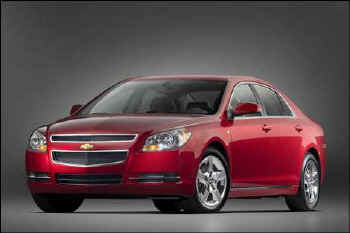 Along with the LS and Hybrid, the Malibu lineup includes the 1LT and 2LT trim levels and the top-of-the-line LTZ. MSRP for the 1LT is $20,955; 2LT, $22,635 and the LTZ, $26,995. All include the $650 destination charge. Malibu, arriving in dealerships in November, combines fuel efficiency, performance and a long list of standard amenities wrapped in a design that carries the new face of Chevrolet. It features a strong body structure, precise build quality and refined driving dynamics. It is more than three inches longer than its predecessor, with a six-inch-longer (112.3 in / 2,852 mm) wheelbase. GM’s StabiliTrak electronic stability control system is standard on LT, LTZ and Hybrid models. A number of equipment packages also are available and include features such as power-adjustable pedals, premium seating, uplevel interiors; power equipment groups and a deluxe audio system. Malibu performance comes from two powerful yet fuel-efficient dual-overhead cam four- and six-cylinder engines, including a standard 169-horsepower (126 kW) 2.4L Ecotec DOHC four-cylinder engine that delivers 30 mpg highway, 22 city (’08 EPA); and an available 252-horsepower (188 kW) 3.6L DOHC V-6 with variable valve timing, rated at 26 mpg highway and 17 city. The Malibu Hybrid, featuring the affordable GM Hybrid System, also goes on sale in November. Powered by a hybrid version of the 2.4L Ecotec, it is rated at 32 mpg highway and 24 city. Four-cylinder-equipped models come with a four-speed transmission with overdrive. A six-speed automatic transmission is standard with the 3.6L V-6 and will be available next spring on the four-cylinder-equipped LTZ – the first four-cylinder engine/six-speed transmission combination in the segment. Premium eight-speaker, 210-watt sound system standard on LTZ and available on 2LT. The Malibu is built at the GM Fairfax Assembly Plant in Kansas City, Kan. The dependability of the 2008 Malibu is backed by GM’s five-year/100,000-mile powertrain warranty, the best protection package in the industry, providing customers with added peace of mind and value during their ownership experience.